I was one of the lucky people to win a prize in the raffle when I attended a Stampin' Up workshop recently - a handy set of floral stamps which I'm sure will come in for lots of different cards when I have more of a play. They are clear polymer stamps and require multi-stamping for effect although of course you could just stamp the outline image and colour in the usual way. I cut a square of white card slightly smaller than a card blank and die cut a section in one corner, backing this with paper to match the colours of the stamping. Unfortunately my scanner has 'translated' the colours so that they appear different but they are a much better match in real life - sigh!! I then used the Misti to position the various stamps to colour the lavender, leaves and ribbon; also it came in handy for placement of the sentiment as well. Finally sponged lavender ink around edges of panel and popped it onto the card blank. 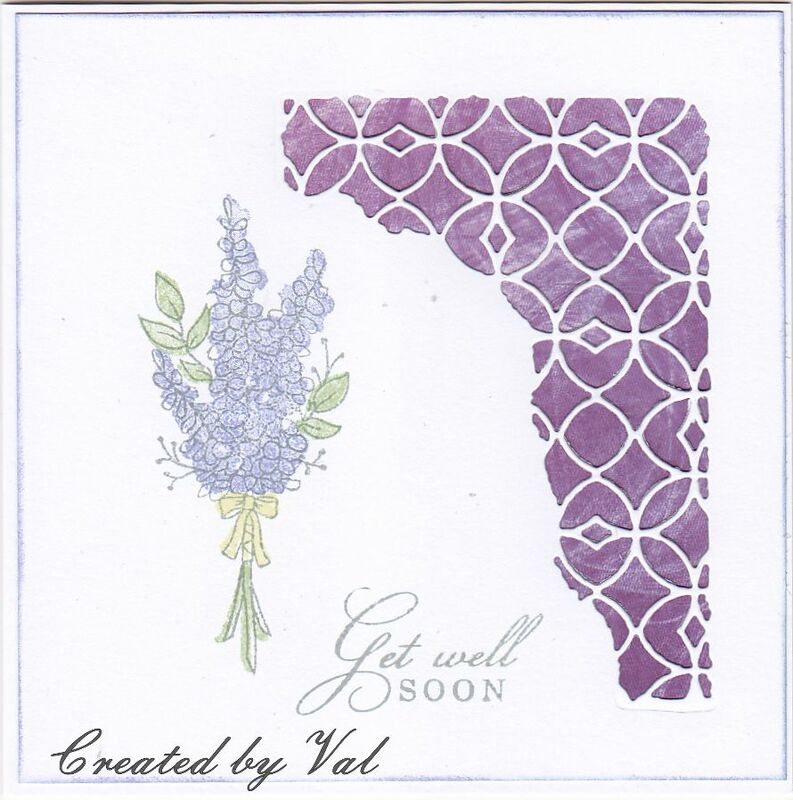 A beautiful Get Well card Val. I love the die cut corner. Beautiful card, Val. I wish you always be lucky. Kisses, my friend.